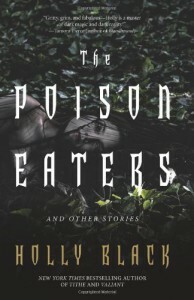 The Poison Eaters is a collection of short stories, most of which have been published in various anthologies over the years. They are all supernatural in nature, though the subjects vary wildly, from faeries to werewolves to normal human beings with extraordinary abilities. I'm a fan of short story compilations, because you're almost always guaranteed to find at least one that suits your taste (plus, they fly by). I was lucky this time - there were several stories I thought were exceptional, and though Poison Eaters did fly by, I was very sad to see it go. 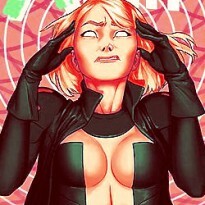 There were two aspects of Black's writing that had me hooked from page one, and they're qualities you so rarely find anymore that I'm actually kind of excited to move on to some of her older books. For one, she does an excellent job of creating an atmosphere and conveying emotion. Each story in The Poison Eaters had its own distinct feel, a mood, that emanates from the story. It draws you in and firmly plants you in its world, in its protagonist's head. You feel what the characters are feeling, and get an amazingly resonant portrait of who they are, what their experiences have taught them, what the world is like from their perspective, simply by the way they act and interact. Without once being told, you get their sense of loneliness and desperation, or bittersweet nostalgia, or helplessness, or stark determination. There's no need to relate to them, because you are them. They feel like real people, not characters. I'm always impressed by authors who manage to convey and create so much in so few pages, and how they put to shame other authors who can't do that over the course of a whole book (or worse yet, a series). HI PEOPLE, THIS IS HOW YOU DO IT. The second aspect I really appreciated about Poison Eaters was Black's ability to beautifully weave her metaphors and plots into one seamless, unified being. We've talked before about how many paranormal romances use the supernatural as a method of addressing cultural or social issues (some more blatantly than others), but...well, let's just say subtlety isn't usually their strong point. Most of the time they feel the need to spell out the message they're trying to get across, or so thinly veil it that there may as well not be a veil at all. Other times it's so painfully shoehorned in that a Wheel of Morality segment would often be less jarring. But that's not an issue Black seems to have. Here, for the most part, the characters, the story, and the world are the metaphor.